Home / What happens after my course? At Becky Adlington Training, our learners do so much more than turn up and gain a qualification – Once you’re a member of the BAT Family, you’re a member for life! 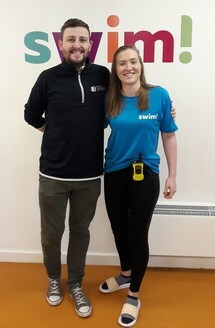 Not only will we be offering CPD opportunities to our Becky Adlington Training Alumni, but our links with partner swim schools across the UK mean we may even be able to offer you a career at the end of your course. What is the best thing about working as a swim teacher? I love seeing the children enjoying themselves and progressing using the skills I’ve taught them. I’m teaching them a life skill that they’ll have forever and that could potentially save their’s or someone else’s life. The bond you build with both the children and their families as a teacher is so special as well and you can really share their pride when the children achieve something new – It’s an amazing feeling. What part of your Becky Adlington Training course has helped you the most since you’ve started teaching? The level of knowledge that was passed on from my tutor, Graeme throughout my course – such as which games to use and how to adapt them to each skill level. What tip would you give someone thinking of becoming a swimming teacher? Being a swimming teacher is so rewarding and I can honestly say that I love what I do, but anyone thinking of doing the same should know that there’s a huge level of patience and understanding needed. Some children will understand and complete a task in their first try, but for some children, it could take months and trying to get over a hurdle such as confidence is a huge task. Remaining patient and understanding why they’re struggling can help when dealing with a difficult task or a scared child. Something as simple as blowing bubbles can be a massive step for some kids so all I’d say is go at their pace and support them – they’ll build confidence and find their love for swimming in their own time. How easy was it to find teaching opportunities after completing the course? There are a lot of paths you can go down these days to suit whatever your situation, from self-employed to full-time employment opportunities. BAT have links with all these great swimming schools around the country so they helped me find the right path for me. swim! was one of their related swimming schools which wasn’t far from me - I’ve been there for nearly 9 months now, doing a job that I love and am so passionate about. What has been your favourite moment since you’ve been teaching? Being thanked by parents for helping their child overcome a fear or something they’ve really struggled with. There is nothing better than helping a child build their confidence and support them in reaching their full potential. I worked so hard with one boy in our lower ability group; he was so scared and hated putting his face in the water. Eventually, I got him confident enough to swim in the correct body position with his face under and he‘s coming on leaps and bounds! I see him with his dad now and again around the centre, and although I no longer teach him, I still have a great bond with both of them and will continue to support him throughout his swimming journey.